Dr. Gurinder Bedi is one of the top Orthopedic Surgeons in Vasant Kunj, Delhi. Dr. Bedi did his post-graduation from MAMC and after doing his Sr. Residency from LNJP Hospital, went to England where he worked for about 12 yrs. Dr. Gurinder Bedi has worked in various University Hospitals there with many a Specialist of international acclaim. Dr. Bedi's main practice in Fortis hospital has been Joint replacement especially Knee and Hip, Arthroscopy and Sports injury and Foot problems besides managing Spinal problems. Dr. Bedi has an experience of over two decades in his field. 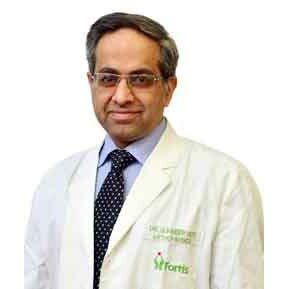 Dr. Gurinder Bedi has been associated with FORTIS Hospital for quite some time and along with his colleagues have performed almost all common surgical procedures. The Orthopaedic team which he has set up provides the most comprehensive Orthopaedic service putting together years of experience between themselves. The team together does about 100 spine procedures/ over 400 joint replacements/ about 100 arthroscopies and about 500 trauma procedures in one year. Dr. Gurinder Bedi regularly lectures on many international and national level conferences besides being an AO trainer. MBBS - Delhi University - 1988. MS - Orthopaedics - Maulana Azad Medical College, New Delhi - 1994. DNB Orthopedics - National Academy of Medical Sciences, New Delhi - 1994. FRCS - Royal College of Surgeons, Glasgow, UK - 2000. FRCS (Orth Surg) - Inter Collegiate Board, Royal College of Surgeons, UK - 2004. CCST(Internal Medicine) - Intercollegiate Board of Royal College of Surgeons, UK - 2005.